Close by in neighboring Pike River Watershed, Mike and Denna Benjamin manage a herd of 550 dairy cows and crops 1,000 in East Franklin. At Riverview Farm, conservation practices like a waste storage facility and bio-digester, crop rotation, residue and tillage management, cover cropping, nutrient management, and an access road for livestock are protecting soil and water quality. The farm’s proximity to Lake Carmi is one of the reasons that the Benjamin’s are committed to managing their resources with conservation in mind. Farmers like Mike and Denna are doing everything they can to minimize their impact. Mike says water quality is important to them. “My parents bought this farm in 1943,” he explained. They were early adopters, installing a manure pit in the early 1980’s for improved utilization of nutrients. A few years ago, they started practicing manure injection. This technology helps reduce air pollution and allows for more precise application of manure to fields which reduces harmful runoff into nearby waterbodies. Both farmers worked with the Friends of Northern Lake Champlain (FNLC), led by Advisory Board Chair Dr. Kent Henderson. Through an agreement with the USDA-Natural Resources Conservation Service, FNLC worked with NRCS and other partners in the Pike and Rock River Watersheds to ramp up conservation implementation. The Benjamin and Fiske families were early adopters of conservation, and are both involved in their local watershed action groups. Henderson says he has seen a shift in these watersheds, even before the Required Agricultural Practices (RAP’s) implemented by the Vermont Agency of Agriculture, Food, and Markets. A drive through both watersheds reveals a landscape where conservation practices are abundant. “There is real momentum growing,” says Henderson. Through the FNLC agreement with NRCS, an outreach and education plan was initiated in both watersheds to ensure that farmers were aware of the programs and services available to them, including NRCS’ Environmental Quality Incentives Program (EQIP). This Farm Bill program helps farmers install conservation practices that protect and improve soil and water quality including reduced tillage, nutrient management, cover crops, permanent seeding, buffers, and prescribed grazing. The agreement between FNLC and NRCS is part of NRCS’ five year strategic watershed plan to target watersheds with the highest phosphorus loads. These include St. Albans Bay, Pike River, Rock River, and McKenzie Brook in Addison County. Working with state and local partners, NRCS allocated financial and technical assistance to these areas through EQIP. The conservation practices installed in the Lake Champlain Basin over the last few years are already making a positive, and measurable, impact on soil and water health,” report Vermont NRCS State Conservationist Vicky Drew. This summer, NRCS published promising news about the results of the conservation work implemented in these areas, thanks to the efforts of dedicated farmers. In the targeted watersheds, models were used to estimate the effects of conservation practice implementation. “Data for the Pike and Rock River watersheds indicates a projected reduction of phosphorus runoff to both Lake Champlain and improvement was also indicated in Lake Carmi as well,” explained VT NRCS Water Quality Specialist Kip Potter. Because of the use of conservation practices, the goal of reducing phosphorus in both Pike and Rock River watersheds is being accomplished. In the Pike Watershed, the amount of cover crops planted and the amount of reduced tillage used increased significantly in 2016. The amount of nutrient management and permanent seeding also increased in the watershed. In the Rock River Watershed, the amount of cover crops planted and use of reduced tillage increased in 2016 as well. Thanks to these farmers for their commitment and stewardship which is protecting and improving soil and water quality in the Pike and Rock River Watersheds and beyond. Are weeds bad? Our lake shore is covered with weeds. It seems like they have gotten worse over the years. Its hard to get our boat in and we have trouble swimming off our shore. What should I do? Great question. And one without a simple answer. It depends on the kind of weeds. 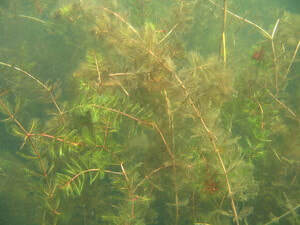 Pond weeds or aquatic macrophytes, are an important part of most aquatic ecosystems. They create much needed habitat for nearly everything that lives in the lake (fish, invertebrates, crayfish, turtles and so much more). The plants serve as cover to protect them from predation and creates safe places to lay eggs or hide their young. Aquatic plants are also an important food source for many animals like ducks, geese and some song birds, otter, beaver, turtle and even moose. And don’t forget invertebrates, and those invertebrates in turn feed many of those great sport fishing species. Aquatic plants also help stabilize the shore by acting as a breaker and absorbing the energy of wave action. Plants are also an important part of nutrient cycling, they help oxygenate the water and may soak up some types of pollutants. Plants are such an important part of a healthy aquatic ecosystem! When good plants go bad: invasive species. When an organism is taken out of its natural ecosystem, it looses its checks and balances, or predators and limiting growth factors. Eurasian milfoil is an extremely common invasive species in Lake Carmi. After arriving at Lake Carmi it found plenty of sunlight and nutrients with welcoming soft sediment and no predators to stand in its way. Soon it took over, squeezing out many native plant species. This leaves fewer plants that are depended on by the natural ecosystem. So invasive aquatic plant species are without a doubt, NOT a good thing for the lake Carmi ecosystem. But, be careful, there are 6 milfoil species native to Vermont and we do not want to wipe out the wrong one. Coontail is a native plant, but looks similar to milfoil. If you are absolutely sure you have correctly identified an invasive species, it would be ok to try to remove it. However, milfoil is sneaky and if broken plant bits get away from you, it can reroot and grow a whole new plant. If you are removing milfoil from your lake shore, be sure the plant parts are disposed of outside the watershed. And please, do not pull up native plants, we need those, they are so important. Also, when native plants are removed, it creates more vulnerable space for the invasive to proliferate. Shading your shoreline would be a great way to help reduce aquatic plants near your shore. Tall, large canopied trees would be best, but even shrubs would still shade the water for some of the day. Unfortunately at this point, milfoil seems to have a strong stake hold on Lake Carmi and at this point, there is no means of eradication on the horizon. Stewarding the lake, impacting it as little more as possible is out best chance. The weed harvester is certainly helpful for reducing the nascence for boaters, and is likely ecologically a wash. In the years to come we will hopefully have more options such as the Milfoil Weevil, an insect predator. But we need to be certain that introducing something else to the ecosystem wont have catastrophic unforeseen consequences. We also know a bit about Lake Carmi’s nutrient and plant history. Samples can be taken from deep sediment in the center of the lake, know as core samples, and read much like studying the rings in a tree. Lake Carmi has always been higher in nutrients than most Vermont lakes due to the fertile soil in the watershed. Aquatic plants have likely always been an important part of the ecosystem here. But human disturbance and the additional nutrients we bring with us have tipped to balance to problematic levels. So, are pond weeds bad? Yes and no. It depends on the which species and what your objectives are. Hope this helps!